(Español, abajo) Summary of the conflict - The platinum mining corporation Lonmin, based in the UK, 25 % of which is currently owned by Glencore, has been denounced for its activities carried out in Marikana, Rustenburg, South Africa, since 2004. Lonmin’s activities have been linked by the affected communities with environmental damage caused by exceeding the limits of emission of dust, sulphur dioxide, and calcium sulphide, and for causing water pollution with irregular discharges. Moreover, and with regard to the workers it employs, on August 16th 2012, 34 workers were killed and 78 were injured by the South African Police and Lonmin Security Guards, while they were on strike and protesting peacefully. The protest was the result of a five-month long struggle targeting the corporation for a decent living wage. Needless to say, Lonmin’s actions, the complicity of Cyril Ramaphosa, deputy president of the ANC, and now deputy president of the South African government, as well as the murderous actions of the SAPS, are all blatantly in violation of international human rights law, especially of the UN Universal Declaration of Human Rights, the International Covenant of Civil and Political Rights, and the International Covenant of Economic, Social and Cultural Rights, as well as in breach of basic international labour standards, recognized by the International Labour Organization. History of the conflict Despite being registered in the UK, Lonmin, since 1999, has all its operations in South Africa. It has been involved in controversies not only when it comes to its environmental impact but also in human rights violations. The Lonmin corporation has benefited from the South African government’s supportive policy framework for foreign investors, which has contributed to its continuing impunity. For instance, the air contamination resulting from Lonmin operations have greatly exceeded the limits for residential and industrial areas. Sulphur Dioxide is another worrying matter, as the limit quantity allowed keeps getting raised to accommodate the corporation’s needs. After exceeding the limit of 4.8 tonnes per day by eight and a half times in 2003, the bar was raised to 17.9 tonnes per day in 2011. Although this decreased again two years later, the levels of Sulphur Dioxide remain alarming. The solution by Lonmin, however seems to bring other contamination – since in reducing the emissions of SO2, Calcium Sulphide is being created as a waste product that contaminates the water of the area. In addition, Lonmin’s labour policies and practices have been strongly challenged by mine workers. In August 2012, 3,000 miners went on strike peacefully demanding higher wages of approximately $1250. 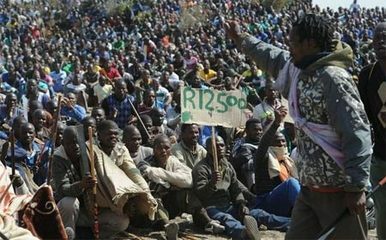 On August 16th, 34 workers were killed and up to 78 were severely injured in clashes involving the South African Police Forces and Lonmin’s security guards, in what is often called the Marikana Massacre. It constituted the most lethal use of force against civilians by South African security forces since the end of the Apartheid era. The tensions around the massacre strongly intensified once it was known that many of the victims were shot in the back and far from the center of the confrontation. A second strike, the longest in the history of South Africa, took place at the beginning of 2014, pursuing similar demands as in the first strike. This strike ended almost half a year later, when the workers signed a 3-year settlement that partially increased the wages of the lowest paid miners. Under national and international public pressure, the Government set up the Marikana Commission of Inquiry (Farlam Commission, named after the chairperson of the Commission). The Commission sat from 23 August 2012 and only concluded its work on 31 March 2015 after numerous extensions, despite the original deadline for investigations and recommendations being October 2012. The President of South Africa has refused to release the findings until the end of June 2015, thus a party of miners that were wounded in August 2012 are now contemplating legal action. The role of the Architecture of Impunity The prevailing policy framework for foreign investors puts the Government of South Africa in a conflict of interest, resulting in the flouting of environmental regulation and social policies, including the mining charter. The rights of workers and the affected communities were abrogated and Lonmin was able to act with impunity. Not only are the limits for pollution adjusted to their advantage. Lonmin, as most transnational corporations do, takes advantage of a complex international legal structure, with subsidiaries on the British Virgin Islands and Cayman Islands, avoiding taxation and engaged in transfer pricing, which also allows them to evade the payment of appropriate wages. Nonetheless, this has been tolerated by the government. The deployment of the national police force in the Marikana Massacre also evidences the support of the government for the mining industry. Soon after the tragedy, President Zuma appointed the Farlam Commission of Inquiry to investigate “matters of public, national and international concern arising out of the tragic incidents at the Lonmin Mine in Marikana”. Among the participants were the families of the 34 deceased striking miners, together with the Association of Mineworkers and Construction Union (AMCU), who presented their testimonies. After three years of proceedings, which included a temporary withdrawal from the Commission by the representatives of the families, President Zuma received the final report on March 31, 2015. However, he has delayed its release, a position that the miners and their lawyers believe that violates the human and potentially the constitutional rights of the workers. This decision has led to a public campaign to pressure the President to release the findings of the commission. Attempts of access to justice The mine workers, with the support of their families, have over several years fought for better wages and living standard. Women in Marikana have played a leading role demanding justice for the families affected by the massacre, highlighting the poor living conditions that gave rise to the strike attention, and since 2012 have taken regular actions to evidence the failures of both Lonmin and the government to provide housing and basic services to workers and their families. Members of the community have researched, monitored and publicized the pollution and environmental effects of Lonmin’s operations. Women have marched on the police to demand justice, have organized a local crèche and agricultural cooperative, and in August 2014 organized a site inspection and public speak out to highlight to the wider public the deplorable living conditions in Marikana two years after the massacre. What Justice could do: a say from the PPT In a hearing that was held in Geneva in June 2014, the Permanent People’s Tribunal (PPT) listened to the testimonies of Joseph Mathunjwa, President of the Association of Mineworkers and Construction Union (AMCU) and Primrose Sonti, from a women’s organisation in Marikana, called Sikhala Sonke. In line with the evidence brought before the PPT Panel by these witnesses, the Tribunal recognized the actions of the transnational corporation as another example of violations of human and people rights. In line with its full judgement of Madrid, in May 2010, and just a few months before the session that was held in Mexico in December 2014, the PPT underlined once again how transnational corporations, including Lonmin, systematically violate human and peoples’ rights in the interest of corporate profits. In the same line, the PPT recognized in this widespread practice the current shortcomings of international law, namely the impossibility of accessing justice and obtaining a remedy, which remains an unbearable burden for affected communities. In the same spirit, the PPT acknowledged the necessity to strengthen international legislation, including through a binding treaty on transnational corporations in order to hold transnational corporations accountable for their actions. Español Resumen del conflicto La empresa minera de platino Lonmin, basada en el Reino Unido y cuyo 25 % es propiedad de Glencore, ha sido denunciada por sus actividades en Markikana, Rustenburg, South Africa. Las actividades de Lonmin han sido relacionadas por las comunidades afectadas con los daños causados al medioambiente al exceder los límites de emisión de polvo, dióxido de azufre, y sulfuro de calcio, y por contaminar el agua con vertidos ilegales de residuos tóxicos. Pero quizás más grave sean los eventos del 16 de agosto de 2012, donde 34 trabajadores fueron asesinados y 78 fueron heridos por las Fuerzas de Policía de Sudáfrica y por guardias de Lonmin Security durante una huelga y manifestación pacífica. La protesta fue el resultado de una lucha de cinco meses reclamando a la compañía un salario decente. Como era de esperar, las acciones de Lonmin, la complicidad de Cyril Ramaphosa, vicepresidente de ANC y ahora del gobierno sudafricano, así como las acciones del Servicio de Policía del país, están en clara violación del derecho internacional, especialmente de la Declaración Universal de Derechos Humanos, del Pacto Internacional de Derecho Civiles y Políticos y del Pacto Internacional de Derechos Económicos, Sociales y Culturales, así como de los estándares laborales internacionales fundamentales reconocidos por la Organización Internacional del Trabajo. Historia del conflicto A pesar de estar registrada en el Reino Unido, Lonmin, desde 1999, opera íntegramente en Sudáfrica. Las polémicas en las que se ha visto envuelta no abarcan solo el impacto medioambiental de sus actividades sino también importantes violaciones de Derechos Humanos. Lonmin se ha beneficiado del apoyo del Gobierno de Sudáfrica en materia de políticas de inversión extranjera, lo que ha contribuido a la continuidad de la impunidad. Por ejemplo, la contaminación resultante de las operaciones de Lonmin ha excedido en gran medida los límites para áreas residenciales e industriales. La existencia de dióxido de azufre es otro de los mayores problemas, pues la cantidad límite permitida para las empresas continúa siendo elevada cada poco tiempo para adaptarse a los intereses de la transnacional. Tras exceder en 2003 el límite de 4,8 toneladas al día por una cantidad ocho veces mayor, éste fue elevado a 17,9 toneladas diarias en 2011. Aunque la cantidad permitida fue reducida dos años después, los niveles de sulfuro de azufre continúan siendo alarmantes. La solución de Lonmin al problema, sin embargo, parece traer otro tipo de contaminación – dado que al reducir las emisiones de SO2, se crea sulfuro de calcio, contaminando las aguas de la región. Además, las políticas de empleo de Lonmin han sido duramente criticadas por los propios trabajadores de la empresa. En agosto de 2012, 3.000 mineros entraron en una huelga pacífica demandando salarios más elevados de aproximadamente $1250. El punto de mayor intensidad del conflicto ocurrió el 16 de agosto, cuando 34 trabajadores fueron asesinados y otros 78 fueron heridos en enfrentamientos con las fuerzas de Policía sudafricanas y la seguridad de Lonmin, en lo que comúnmente se denomina la Masacre de Marikana. Estos eventos constituyeron el uso de fuerza contra civiles más letal a manos de las fuerzas de seguridad del Estado desde la época del Apartheid. La tensión ya existente tras la masacre se intensificó una vez se supo que muchas de las víctimas habían sido disparadas en la espalda y alejadas del centro de la confrontación. Una segunda huelga, que resultó siendo la más larga de la historia de Sudáfrica, tuvo lugar a comienzos de 2014 y perseguía demandas similares a la huelga anterior. El parón acabó tras casi medio año, cuando los trabajadores firmaron un acuerdo de tres años que incrementaba parcialmente los salarios de los mineros peor pagados. Debido a la presión nacional e internacional, el Gobierno formó la Comisión de Investigación de Marikana (o Comisión Farlam, cuyo nombre recibe del presidente de la Comisión). La Comisión se reunió por primera vez el 23 de agosto de 2012 y tan solo concluyó su trabajo el 31 de marzo de 2015 tras varias extensiones, a pesar de que la fecha límite original para emitir las investigaciones y recomendaciones era octubre de 2012. El Presidente de Sudáfrica ha rechazado publicar los resultados antes del final de junio de 2015. Por ello, parte de los mineros heridos en los eventos de agosto de 2012 están contemplando acciones legales. El papel de la Arquitectura de la Impunidad Las políticas predominantes de inversión extranjera evidencian el conflicto de interés en el que se encuentra el Gobierno de Sudáfrica, del que resulta la transgresión de la regulación medioambiental y de política social, entre los que se encuentran el código minero. Los derechos de los trabajadores y las comunidades afectadas fueron derogados y se permitió a Lonmin actuar con impunidad. No solo eran los límites de contaminación ajustados en su beneficio. Además, como la mayoría de empresas transnacionales, Lonmin ha sacado provecho de una compleja estructura legal internacional, con filiales en las Islas Vírgenes Británicas y en las Islas Caimán, pudiendo así evadir impuestos y sortear el pago de salarios apropiados. De cualquier forma, todo ello ha sido permitido por el Gobierno. El despliegue de la policía nacional en la Masacre de Marikana evidencia también el apoyo del Gobierno a la industria minera. Poco después de la tragedia, el Presidente Zuma formó la Comisión Farlam para investigar “asuntos de interés público, nacional e internacional surgidos de los trágicos incidentes en la mina de Lonmin en Marikana”. Entre los participantes de la Comisión se encontraban las familias de los 34 mineros en huelga que perdieron la vida, así como la Association of Mineworkers and Construction Union (AMCU). Tras tres años de procedimientos, los cuales incluyeron el abandono temporal de la Comisión por parte de los representantes de las familias afectadas, el Presidente Zuma recibió el informe final el 31 de marzo de 2015. Sin embargo, ha retrasado su publicación, una posición que los mineros y sus abogados consideran que atenta contra los derechos humanos y (potencialmente) constitucionales de los trabajadores. La decisión ha provocado una campaña de presión contra el Presidente para que haga públicos los resultados de la investigación. Intentos de acceso a la justicia Los trabajadores de la mina, con el apoyo de las familias, han luchado durante años por mejoras de su salario y su nivel de vida. Agrupaciones de mujeres en Marikana han tomado un papel protagonista en demandar justicia para las familias afectadas por la masacre, destacando las malas condiciones de vida (catalizador principal de la huelga), y desde 2012 han desarrollado acciones regularmente para evidenciar la responsabilidad tanto de Lonmin como del Gobierno al no proveer de alojamiento ni servicios básicos a los trabajadores y sus familias. Miembros de la comunidad han investigado, monitoreado y publicitado la contaminación y los efectos medioambientales de las operaciones de Lonmin. Estos grupos de mujeres han marchado frente a la policía para demandar justicia, han organizado una cooperativa local de agricultura y, en agosto de 2014, organizaron una inspección de las zonas mineras y una acción pública para mostrar a la población las deplorables condiciones de vida de los trabajadores dos años después de la masacre. Lo que la justicia podría hacer: una opinión del TPP En la sesión en Ginebra de junio, 2014, el Tribunal Permanente de los Pueblos (TPP) escuchó el testimonio de Joseph Mathunjwa, Presidente de la Association of Mineworkers and Construction Union (AMCU) y de Primrose Sonti, de una asociación de mujeres de Marikana, bajo el nombre de Sikhala Sonke. De acuerdo a lo expuesto ante los jueces del tribunal, éste reconoció las acciones de la corporación transnacional como otro ejemplo de violaciones de derechos humanos y de los pueblos. De acuerdo a la sentencia de Madrid, en mayo de 2010, y unos meses antes de la sesión que tuvo lugar en México en Diciembre 2014, el TPP resaltó de nuevo cómo las corporaciones trasnacionales, incluida Lonmin, violan sistemáticamente estos derechos para su propio beneficio. El tribunal reconoció en esta extendida práctica la evidente limitación del derecho internacional. La imposibilidad del acceso a la justicia y a obtener remediación está convirtiéndose en una carga cada vez mayor para las comunidades afectadas, así como las leyes que deberían protegerlas. Así mismo, el TPP reconoció la necesidad de mejorar la legislación internacional, incluyendo un tratado vinculante para las corporaciones transnacionales y un Tratado de los Pueblos, para que así estas empresas sean consecuentes con sus acciones. Development of Alternatives The workers reached a settlement with the mining company after a five -month long strike in 2014. The Alternative Information and Development Centre (AIDC) is supporting the leading local trade union, AMCU, to fundraise for sustaining its campaign for decent wages and housing. 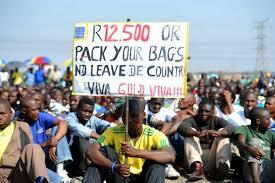 The AIDC and the Trade Union are investigating the suspected tax evasion and transfer pricing in relation to Lonmin. Why? Explain briefly. The government does not seem likely to punish the mining companies for their environmental and economic crimes. Regarding the Marikana Massacre, it will all depend on the outcome of the Farlam Commission report and how these get taken up. The miners and their families are preparing to lodge significant civil claims against the state and possibly also Lonmin which may yield some justice for the deceased and injured workers and their families.